I Do Not Want a French Bulldog. It's been awhile since I've done a painting in progress for you all. It isn't that I haven't been painting. I've painted a lot, thanks in part to my resolution to blog less and paint more. For a good step-by-step blog series, I have to be working on a larger, more complex painting, because there's not all that much to say about painting small illustration vignettes. 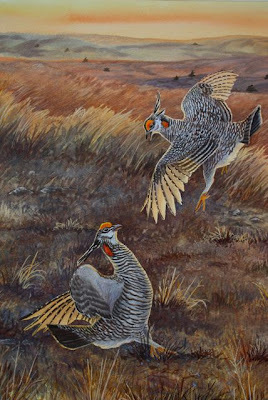 So when I was asked to paint the poster art for the Lesser Prairie-chicken Festival in Woodward, Oklahoma (for which I will also be presenting a keynote and workshops April 16-21), I thought that would be the perfect subject for a step-by-step treatment for the blog. Here's how it came out. Original is 14" x 18"
As with all of my watercolors, I cook the painting in my head for a long time--sometimes months--before I take brush in hand. 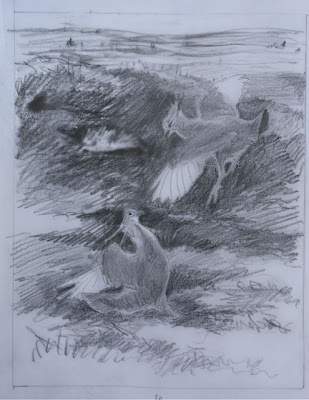 In this case, I'm pleased, looking back on my initial thumbnail pencil sketch, to see how closely the final painting adheres to the original concept. Of course, it never turns out exactly as I've envisioned it, and I might take a completely different approach if I had world enough and time to do it over, but I try mightily to get close to the vision. And the vision was action, drama, and low dawn light. The day I started work on it was dark and rainy, and I had left my good camera in town, drat! So I fuddled through with a couple of unfabulous shots of the opening washes. Of course, I've masked the birds out with film and liquid masking compound, so I can paint freely over them without sullying the paper where they'll be. This part is always kind of scary, wondering if you've sealed the edges of the masking film sufficiently to keep your wild wet washes from intruding. (I hadn't.) Not to mention that you're doing an underpainting in a bright color that has little to do with the final look of the piece. Yikes. Today, having just put the final touches on the painting, I'm SO glad it's done. There's a whole lotta work between this splashy, fun-looking part and the finished painting. This one turned out to be a weeklong mama bear of a project. The original is 14" x 18," which is pretty big by watercolor standards. Obviously, I did a lot of work between the splashy yellow stage and this next one, but it was pouring outside and I couldn't take the painting out to photograph it. Also, I forgot about photographing it. When you're wrestling with grass, the nemesis of many a wildlife painter, you have to just get down and deal with it. While grass-wrasslin', I paint a wet-on-wet Oklahoma prairie landscape and sky behind the grass. That came out OK. Back to the grass. I hate painting grass. Always have, probably always will. It's so easy to get too mechanical with all those little blades, and it's really, really hard to paint them so they look acceptably real but not repetitious. It's important to vary your color. I probably varied mine a bit too much here. Whatever... I know I'm going to err, so I try to err on the side of going too loose and splashy with it. At least that way it won't end up looking like a plugged hair transplant. 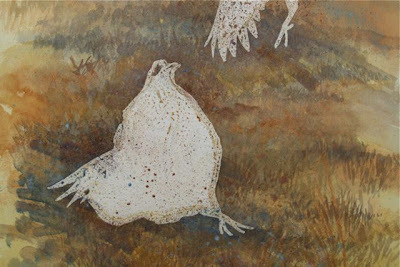 There's this tension in many of my bird paintings between the rendering of the bird, which is usually pretty tight and specific, and the rendering of the habitat, which is often much less so. The tension comes when there's too great a disparity between the two. You don't want superrealistic birds in a completely loopy landscape. The other thing that's going on here is that my vision for the birds includes strong backlighting, the kind of low, intense light you get at sunrise. 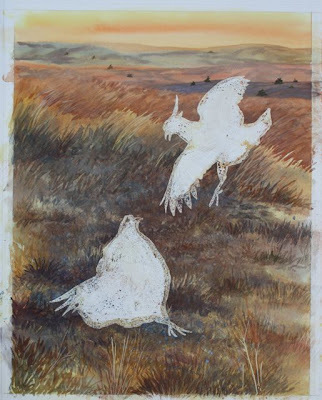 Above all, the painting has to say sunrise, because that's when prairie chickens get busy on their booming grounds. So I'm continually darkening and darkening the foreground because I want the birds to be lit up against it, and to pop out of it. That's why we're looking at purple grass here. I have to keep the faith while painting purple grass that this is all going to work out in the end. Next: I move on to the birds, but keep working on the grass. Always the grass. I got a very special Valentine from Chet Baker when he waded out this morning through belly-deep boilerplate snow and presented me with some (dog) chocolates. This, after four days of holding out. I had shoveled a Pee Alley with foot-high walls right out the front door, but the little gentleman much prefers the back meadow for more important business. You all have my permission to exhale now; I know you were waiting to hear this, and worrying right along with me. I have been shut inside this house with my school-free kids, our brains slowly liquefying, for oh, about a month too long, and heard this morning there might be another 8" on the way. Of snow. Eight more inches of snow. Isn't that romantic? Here's wishing you a happy Valentine's day. For those of you who get to spend it in a tete a tete in a fancy restaurant, drowning in wine and red roses with someone you're mad for, good for you. Good for the fancy restaurant, good for Hallmark, good for the florists. For we ordinary mortals, whether you're kissing a human, a horse, cat, dog, bird, or small furry rodent,** just make sure you kiss somebody, and tell them you love them. Actually, I think your last image (of the painting, not Chet Baker's kissable mug) doesn't look too purple at all! I love the range of shades you've achieved in the grass, all of which look very believable. It's great to hear that you're having such fun. Keep up the great work, and can't wait to see more! Thank you for the Chet photo. Our beloved Fiona died a month ago, at the ripe old age of 15 1/2. We are bereft, as I'm sure you can imagine. 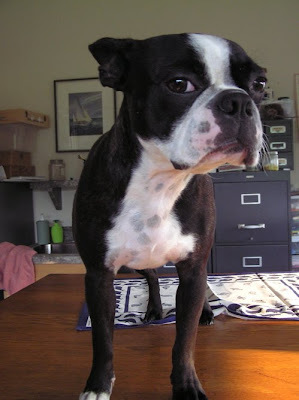 Perhaps a new Boston, at some point. Perhaps a rescue dog, Boston or otherwise. But for now, just cats... who are, while charming, not the same. So I turn to you for my Boston fix. Give Chet Baker a Valentine's kiss for me. It's a treat to see Prairie Chickens come to life here. Dessert being kissy face. Kimb - another Boston will help. One of mine is nearly 14 and I might need another! Foregrounds are my nemesis...still haven't figured out how to do them realistically...but you have helped. Thank you! Awesome painting, BTW! Your resolve to blog less and paint more has done a wonderful thing. That, and the interminable snow. I love watching your paintings unfurl almost as much as I love the Bacon. Plant a kiss on the little gentleman for me. It's always so interesting to see how these ideas start and what you go through to make them come to life. Amazing. 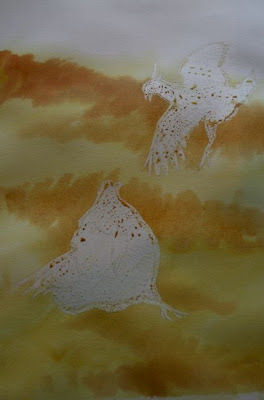 I loved your watercolor and the work in progress in writing and images...inspiring. Julie, your grasses are just fine. Not too fussy and a lot of movement going on there. The birds seem to stand out a bit much for me. Maybe that's just the computer effect. Could you soften the edges a little to get them to blend in with the background. Many condolences. I can't imagine. Your photo looks like the kind of pics I take with my Mac when Chet's on my lap. I hope you find the Chetfixes helpful and comforting, and I think you should go do an image search for "Frenchton." That'll get the puppy fever going real good. Worked for me--I can't look at them! Thanks for the support, guys! Nice to know the grasses look fine to you, Stefanie. To answer your question about the birds' edges--I see your point and agree, but no, unfortunately, I can't adjust them, as it's already been scanned. 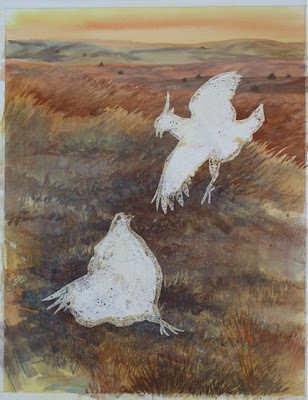 It's fine for a festival poster, I think, to have birds that sort of pop off the page, but for an easel painting it might have been nice to lose an edge or two. Next time! After choosing Chet's "Click On Me" icon, I went from the sweet, sweet picture of a younger Liam and Phoebe holding Chet to the wonderful, even sweeter Blog showing Chet babysitting Oona, about two years ago. My heart is melted, the day is complete ! Cool! And so much Baker! Julie, I can't wait to read about the birds. I don't know a thing about how art is created, so this was very interesting to me. I wanted to let you know that I gave a copy of "Letters from Eden" to a friend as a thank-you this weekend and she loved it - practically ignored me to look at the book and start reading it. So loving (and jealous) of your new blog layout. Does this amazing designer have a website so we can contact her or see her other works? Beautiful naturalist work of art! Love the cleanliness and serene atmosphere of your whole composition. I admire your courage to show the step-by-step progress of your work. Often, artist's find it hard to show their unfinished work because it has not yet reached that stage of satisfying their senses well enough to make them want to display it to the world. Thanks. I'm not pretending that this is the be-all, end-all bird painting--even the finished product is far from what I wanted it to be. And my process is almost as scary to write about as it is to go through. But I'm producing something, however imperfect, and I want to share that process. My ulterior motive is to inspire the artist within my readers, and let them know that it's OK to be shaky and uncertain and scared, facing the blank page. 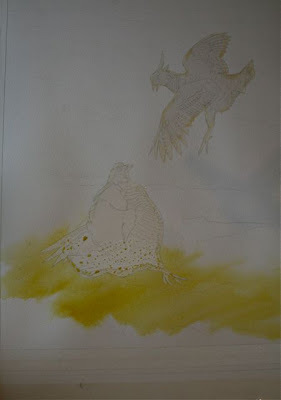 Showing the stages, I hope, makes it more accessible, makes painting feel less risky. Hi Julie. I just found your blog and the prairie chickens. Having been there, the grass is fine. Thanks for posting all your angst. Helps me to know pros have them too, including our individual nemesis. For you it is grass. Chickens at sunrise do show sharp edges due to the feathers being highlighted by the rising sun. Oh Julie, it's so amazing to see the creative process that goes into one of your artistic works. I thought it turned out really neat and I know it's supposed to be Oklahoma, but the background hills reminded me a little bit of my one and only birding adventure in North Dakota. have you noted any oddball "guard bird" behavior from Robins? The frozen, snowy weather has brought Bluebirds to my feeder area for the first time (nine at one time a few days ago), and they seem to enjoy the un-shelled sunflower seeds. I also have put out some live and freeze-dried mealworms and small packaged suet balls. I have a heated water source as well, and the Bluebirds make heavy use of the water. The occassional Robin has also stopped by and eaten a few seeds from the ground feeder. Now I have a deranged Robin that sits nearby in the trees, and swoops down on any Bluebird that dares to land on any feeder! The "mad Robin" ignores all the other birds, but will not abide Bluebirds! He acts just like the Hummingbirds do to their own kind during the summer.